Singapore, with its high levels of safety, first world facilities and great education system, is one of the top choices for expatriates all over the world. In fact, in an extensive survey completed by 1000 expatriates from over 100 countries, Singapore emerged as the top choice in Asia for expatriates and second in the world, behind Switzerland . Indeed, with many emerging economic centres such as China, Indonesia and Malaysia all within a short flight’s reach from the city-state and many pro-business government policies, Singapore has been identified as the ideal location for many multi-national corporations (“MNCs”) to set up their regional headquarters. Naturally, many experienced expatriates have chosen Singapore as their base in the region to showcase their expertise as consultants, trainers or product evangelists. If you fall under this enviable class of jet setting expatriates, this tax guide is perfect for you. First and foremost, you should assess whether you fall under the umbrella of a “tax resident”, as prescribed under the criteria set out by the Inland Revenue Authority of Singapore (“IRAS”). Do note that nationality and citizenship are not the only criteria that determine if you are a Singapore tax resident. a Foreigner who has stayed or worked in Singapore, excluding one who is appointed as a director of a company for 183 days or more in the year before the year of assessment. If you are a tax resident, you would be paying tax based on the rates prescribed under Singapore’s progressive tax system. However, if you are a non-resident, a flat rate of 15% applies, up to the point where your net chargeable income is S$ 433,000*. Once it exceeds this limit, the tax payable is computed based on the residential rates since it results in a higher tax payable than flat 15%. Of course, this non-resident tax only applies if you have worked in Singapore for more than 60 days. In addition, IRAS charges tax separately for different sources of income. For example, directors’ fees and rental income received from property are taxable at a tax rate of 20% . The good news is that overseas income derived outside Singapore, Singapore dividends and bank interest are all considered tax exempt. Given that you may not be familiar with what income falls under “taxable” and “non-taxable” income, do consult an experienced tax agent, who would be able to assist you in assessing the various components of your income. To encourage, attract and retain foreign talent, the Singapore government has implemented a special scheme known as the NOR scheme, specifically targeted at expatriates who use Singapore as a base to reach out to their regional headquarters. This scheme is valid for a period of five consecutive years of assessment (“YAs”). In short, a NOR tax payer will enjoy the benefit of paying income tax on a time-apportionment basis, i.e. 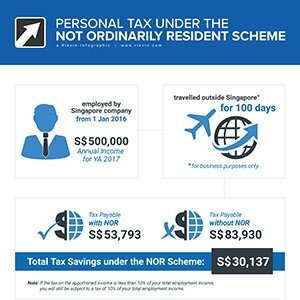 if the total time spent in Singapore is 15 days in a 30 day month, the NOR tax payer’s chargeable income is computed based on 50% of his income for that month. To qualify under the NOR scheme, one must first be a non-Singapore tax resident for the past three YAs and in the year of qualification for the NOR status, must be a Singapore tax resident (i.e., fulfil criteria (c) above). Given that 183 days is little more than 6 months, this is not difficult to achieve. Besides time-apportioned tax, other perks that one can enjoy is tax exemption from your employer’s contributions to an overseas pension fund scheme and exemptions through one of Singapore’s avoidance of double taxation agreements (“DTA”) with 76 other countries throughout the world . Under a DTA, an individual can avoid paying double tax in his or her native country (i.e. country of residence) and the country where he or she is working in. Consult your tax agent to learn how you can apply for tax exemption under a DTA. Income not apportionable include: (1) Director’s fees; and (2) Any amount of income tax payable in Singapore that is borne, directly or indirectly, by your employer. Tax exemption of employer’s contribution to non-mandatory overseas pension fund or social security scheme. Under this concession, if you are a resident Singapore employee, tax exemption will be given to you on contribution made by your employer to any non-mandatory overseas contribution scheme. This is provided that your employer does not claim a deduction for the contribution. The amount of exemption is subject to a cap. Your employer must not claim a deduction in contribution made to non-mandatory overseas pension or provident funds and social security schemes up to the NOR cap. If you are employed by an investment holding company or a tax-exempt body, you would not be able to enjoy the tax concession on the contributions made by your employer to any non-mandatory overseas contribution scheme on or after 1 Jan 2014. Similar to the NOR scheme, the Area Representative Scheme (“AR scheme”) also targets expatriates who travel frequently and operate from a base in Singapore to discharge their regional functions and duties. Qualifiers under the AR scheme also enjoy time-apportionment of employment income but are different in that their employers are also non-resident and income from the foreign employer is not credited directly or indirectly to the accounts of a permanent establishment in Singapore . As IRAS is relatively strict with regard to the definition of a “permanent establishment” in Singapore, it may be wise to consult an experienced tax agent to assess your application, before submission. Notably, the most significant difference between the NOR scheme and the AR scheme is that the taxable income for those under the AR scheme may differ accordingly to the total number of days attributable to work in Singapore within a calendar year. If the total number of days attributable to work in Singapore in a calendar year is 60 days or less Non-Resident Your short-term employment income is exempt from tax. This rule does not apply if your stay covers three continuous years or more. If the total number of days attributable to work in Singapore in a calendar year is 61 – 182 days Non-Resident Your apportioned income will be taxed at 15% or resident rates, whichever results in a higher tax. If the total number of days attributable to work in Singapore in a calendar year is 183 days or more Resident Your apportioned income will be taxed at resident rates. If your stay covers three continuous years or more Resident for all years Your apportioned income will be taxed at resident rates for all years. Once your AR status is approved, you need not re-apply for this status. However, you will be required to annually submit the Area Representative Travel Calculator by 15 April each year . Given that you may have a hectic travel schedule, you may wish to engage a tax agent to assist you with this application annually. Re-application under the AR scheme is also required if you change employer. How do I apply for the NOR or AR schemes? IRAS has a very comprehensive web portal that sets out the information very clearly, with the relevant application forms and supporting documents. However, it is advisable to get a reputable tax agent to arrange this for you. An experienced tax agent would be able to advise you on all the supporting documentation required, keep you updated on the status and can assist you in liaising with the IRAS for your queries, which is particularly helpful since the IRAS helpline only opens during office hours on weekdays and may take up a substantial amount of your time. Moreover, depending on which scheme you wish to apply for, there is different documentation required. It should also be noted that all late applications for the NOR and AR schemes will be rejected by IRAS. Once your application has been approved, congratulations! For those under the NOR scheme, you now have NOR status for the next five years. You will not have to re-apply for this scheme every year. If you have enjoyed NOR status for the past five years and it has lapsed, IRAS does allow applications for renewal of the NOR status and will take into account any YAs that may fall within the earlier five year period during which you had enjoyed the NOR status. If this confuses you, consult an experienced tax agent for assistance on applying for renewal. Alternatively, if you have loved working and living in Singapore over the past five years, why not consider applying for Permanent Residency status? As a Permanent Resident, you would be able to enjoy other benefits such as greater freedom to set up your business in Singapore, more job opportunities and will be free from the hassle of applying for an employment pass. Keen on applying for the Not Ordinarily Resident Scheme (NOR)? Speak to our taxation specialists - we are experts when it comes to Singapore's individual and corporate tax rates and schemes. Our reliable guidance and high success rate comes with 20 years of experience. Secure your NOR status via us.